San Leandro expects a $1.1 million CalPERS rate hike, straining a tight city budget. Elk Grove expects a rate cut, offsetting some of the CalPERS rate hikes already on the way. The CalPERS board, responding to a problem caused by the governor’s pension reform, approved a rate change last week for about 1,200 local governments that have plans with less than 100 active members. The change reduces the rate increase most employers would get under a dozen old “risk pools,” an insurance-like arrangement that prevents a single plan from getting hit by a suddenly soaring rate due to costly disabilities or other events. But the board action combining all of the plans into two risk pools, including new hires given lower pensions by the reform, gives some plans what will be the fourth rate increase in recent years. Since heavy investment losses during the recession, CalPERS already has raised rates with a lower earnings forecast, a new actuarial method and a projection of longer life spans. Milligan suggested that the issue be considered during a review of the CalPERS hardship policy scheduled next month. He said the new risk pool rate does not take effect until July next year, giving employers until next May to apply for hardship rate relief. The old risk pools were undermined by a pension reform pushed through the Legislature by Gov. Brown. New hires get a lower pension than workers hired before the reform took effect Jan. 1 last year. Because of the different pension formulas, the old risk pools were closed to new members. A closed risk pool faces long-term funding problems as members lost through retirement and turnover are not replaced. Importantly, the old risk pools did not fairly distribute payments on debt or “unfunded liability.” Plans with an unfunded liability much larger than their payroll tended to pay less than their fair share, while low-debt plans tended to pay more. Milligan gave the example of a city switching from employing firefighters to contracting out for fire services. The payroll on which pool rates are based drops, but the debt for pensions earned by the firefighters does not, giving the employer a break. Conversely, cities with a low unfunded liability compared to their payroll get a rate cut. But as all of the pools, including new hires, are combined into two pools for “miscellaneous” and “safety” workers, the total employer contribution is unchanged. “I recognize in any type of change like this there are going to be winners and losers,” said board member Henry Jones, but the “overriding theme” is an attempt to treat the plans equitably. Action on a risk pool change was delayed last month to allow more time for responses from local government. CalPERS actuaries met with employer organizations and held a webinar with more than 250 participants. The League of California Cities surveyed its members, finding strong support (94 percent) for the change recommended by CalPERS actuaries and little support (4 percent) for an alternative based on the old risk pools. 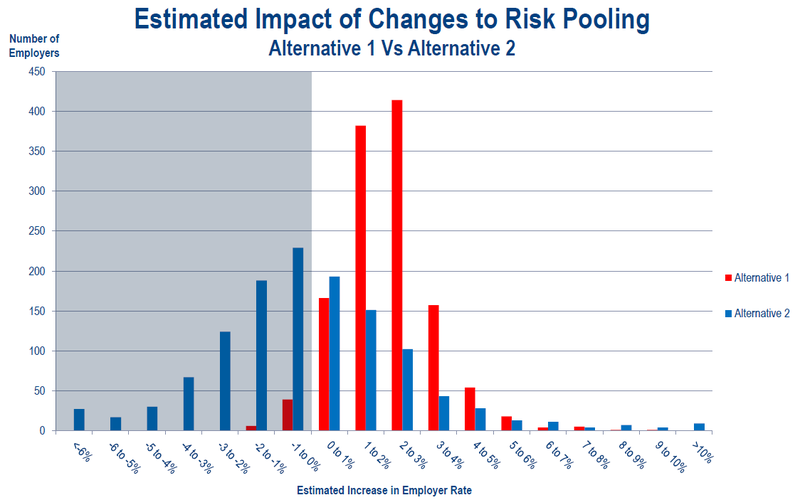 A chart given to the CalPERS board last week shows the distribution of rate changes in the two new risk pools (blue bars) and under the rejected alternative based on the dozen previous pools (red bars). Under the previous risk pools, 90 percent of the miscellaneous plans were expected to have rate increases ranging from zero to 3 percent of pay. About 70 percent of the safety plans were expected to have rate increases of 2 to 5 percent of pay. Under the two large pools adopted by the board, more than half of employers are expected to get a rate cut. Most of the rate increases for the rest range from zero to 3 percent of pay. But some are much higher, a few reaching more than 10 percent of pay. At the board meeting last week, a spokesman for San Leandro, Niccolo De Luca, said the city contracted out for fire services. He welcomed Milligan’s suggestion that some cities may be eligible for hardship relief. A Brentwood official, joining a spokesman for Murrieta and Truckee in thanking CalPERS actuaries, said his city will be aided by setting rates based on each plan’s unfunded liability rather than the plan’s payroll. “As a growing city with a much larger active workforce than retiree base we find ourselves picking up an increasing percentage of the pool’s unfunded liability as our payroll costs increase,” said Kerry Breen, Brentwood assistant finance director. The Elk Grove finance director, Brad Koehn, told the board the new risk pools will keep his city “from continuing to pay more than its fair share” of the unfunded liability and “mitigate” the scheduled rate increases. Koehn said the new risk pools “also provide a mechanism, if the employers are able, to accelerate payments and reduce the employer’s share of unfunded liability,” strengthening the financial position of the employer and the risk pool. Milligan said many employers have been asking for the ability to pay down their share of the risk pool’s unfunded liability. A statewide poll issued by the Public Policy of Institute California last week showed support for paying down debt in several ways. With the projected state budget surplus, likely voters would rather pay down debt and build a reserve (57 percent) than restore some funding for social services cut during the recession (39 percent). A list of the main parts of the governor’s revised budget plan, including increased contributions to the troubled California State Teachers Retirement System and paying down other debt, was favored by 73 percent of likely voters. A November ballot measure backed by the governor and a bipartisan legislative vote that would fund a state budget “rainy-day” reserve, allowing half the money to be used to pay off debt for 15 years, was favored by 74 percent of likely voters.